I love that kind of projects! One question. How do you put these photos into Dromed this way? I'm not sure if I got the dromed toolkit or not, so this might be only available with it. BUT NOTE, you may use this dialog box to do the set command for you, but they won't stay each time you open Dromed, nor are they stored in your COW file. 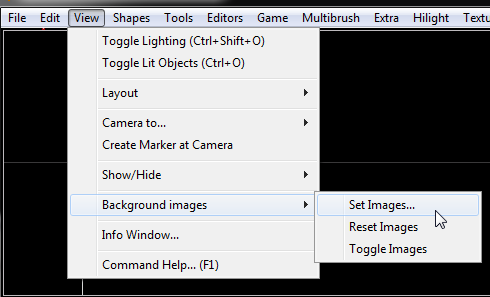 You must note the full command that outputted in your monolog window, in fact you can copy it into your windows clipboard, and paste it into your startup cmd, see image below. Now it will always be there on opening dromed. Note also that this install is only for developing this mission, as recommended anyway, but also, the backgrounds can stay in startup as it's the only for this project anyway. No major update, per se. 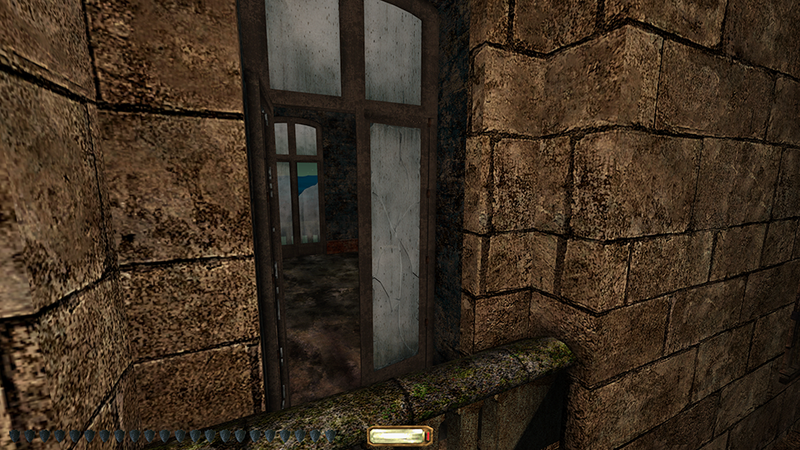 I just have been working on the window tech still. Finally getting somewhere, but also, I wasn't working on it the whole time. I didn't realize my SSD was running out of space and I thought the slow COW loads was that something might be wrong with my PC. Was afraid of corrupting the COW files as sometimes Dromed status bar would stick on "loading mission" long after it loaded. Phantom mentioned the fact this will happen with SSds and so I cleared out space. Thanks for that! Now we're cooking again, and want to share a short video of the glass breaking with glass flinders. The gravity of the glass flinder objects is set really low for the sake of fun. Speaking of fun, I also tried setting elasticity to super high and watch them all fly around bouncing more than the T1 basketball. 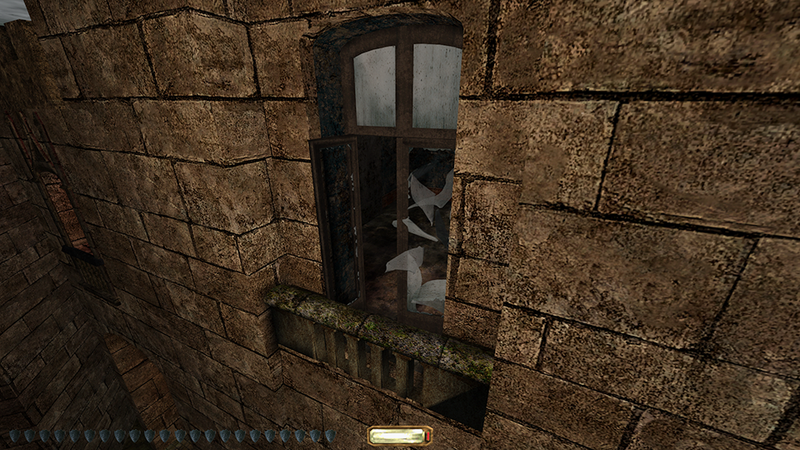 The shards are sourced from the actual initial window pane object. I sliced it up. Technically if I could get Y and Z calculated perfectly I could have them start falling from their actual correct position, thus a crack would appear first, then shards would slowly fall. Oh and I have small particle disks for dust, but I think it needs more tweaking. They two slightly twist before disappearing, so it's like they caught a wind draft. Okay now with some media, I will just note that the hitching is lag on my PC, not yours. You need to turn it into a an objective - something like "Break 90% of windows in the castle". Just so people won't miss it! I think I do this for my own satisfaction. There will be moments where and arrow misses the AI you were attacking, or and explosion from a fire arrow (maybe) that will reveal it. But like I think I've mentioned before, I hate going to try something and it doesn't work like how I know the Author could have done it. Or at least, when we all first played, and we tried something, and was taken back by something working in a way we didn't expect. Like I loved when I tried throwing a bottle to see if the guards go investigate the noise - and did! Now I can't offer big moments like that for the seasoned player, but I can do lots of small details that I would want to see, and rewarding for explorers. Edit: Oh and I gotta lower that glass pitch for thicker windows. to assign the near exact coords of where the flinders should originate, where they should be in relation to each other. Since I cut them from a whole window, in the 3d model program, it should look like a real-ish broke window froze in time - if I set the grave to 0. Ps. Don't worry I actually did a lot of other stuff today lol. Oh wow, I stumbled onto this thread and I can understand why you are documenting your progress. Sometimes it helps just to have a little motivation in what you do. As a player, it provides some interesting insights into developing an actual fm. I appreciate that you have also focused on the story as well which helps to keep players intrigued in accomplishing their objectives. I'll be looking forward to your little progress posts every now and then! Hey, thank you Silen! It keeps me honest and steady. Now the hardest hurdles of the window tech are done. I won't bore you with the under-the-hood details (if you come to the editor's forum a lot you may already know), but I can see why I've never seen smashable windows on a door, well not at least to the detail I have it. There are small touches yet to make but I'm tired of seeing it for now. "Early video of my fan missions' window tech. With the help of carefully placed physics bunderies and some scripting." I became a little obsessed with it, because A) I couldn't accept that it couldn't be done, and B) it would be a chance to force myself to learn more about scripting, which I've treated like the boogeyman. Yes it slowed me down and I probably annoyed the community with asking for help so often, but yeah, will start back carving up some terrain. In other news, Phantom has checked back in with the AI models he's been working on, and yeah.. I wish I could just share what's to come, early, but will stay somewhat spoiler free on AI. Let's just say, the new AI for this place is freakin awesome. When this room you've been seeing in my videos lately is done, I will have to at least show off one of them in a early teaser. And if you didn't read before, this room is to be done first before the rest of the chateau as a "let this show you what it can be like finished" room. There has also been some major changes to story and "these ideas would be cool to feature" list. The story is more smoothed out, finally fixing some problem dead ends. It feels more congealed and reasonable. Also allows for much rewarding spinoffs. 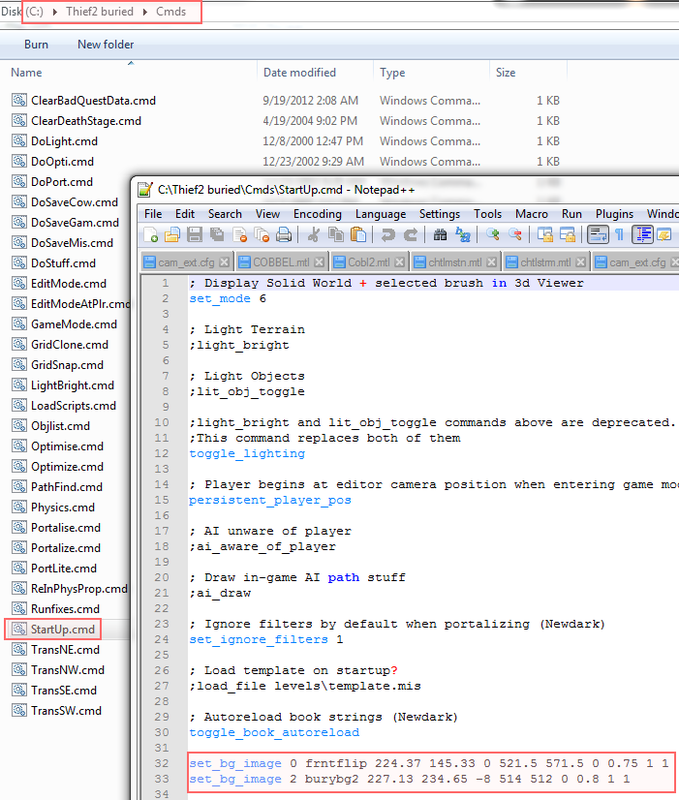 And then my list of cool stuffs, has become more possible now wrapping my head around some scripting basics. There was also, other ideas I let go of, seeing as how the better ideas dominate the story. Cool textures solution! DrK's style. However, with this approach, all the textures on the level should be processed the same way, otherwise it will look bad, disharmonious. Thanks, I am not sure what I'm going for other than, basically I understand the photo-real textures at the start look too washed out. So I give them more contrast and darken them to "gamify" them. I think Drk's are more cruchy and burny if that makes sense, but I get what you mean. I will have to do a walk through many time to spot outliers breaking format. But honestly so far, just getting them to the same darkness and contrast, has worked well. Most of my screens here are brightened by 40%, so the advantages I'm getting for the place to be dark is missing. When all said and done, it's mostly going to be lit by moonlight, mushies, and if the player wants to light some torches... or light their perm flair. 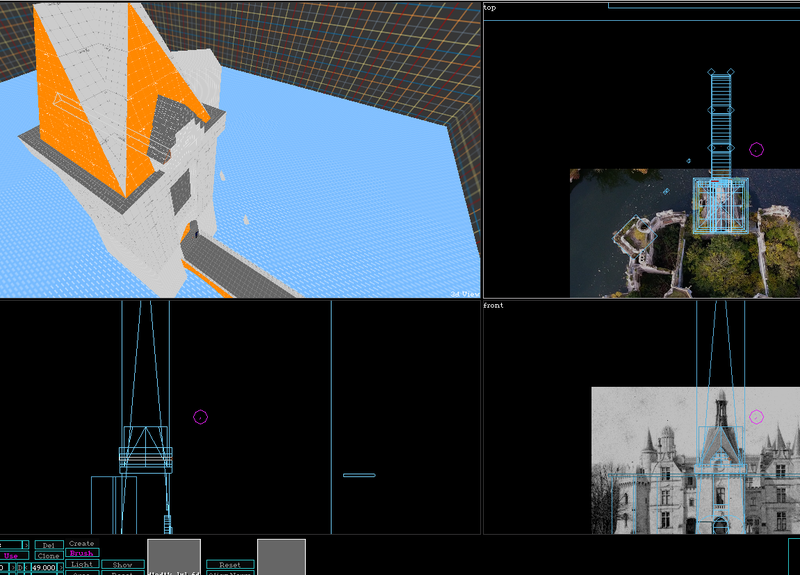 So it will be pretty good I think, but not stressing on it too much, as I'm finding limitations in finding textures. Like painted ceiling beams from this era, I may have to make my own from photos but so much time has already been spent this way. 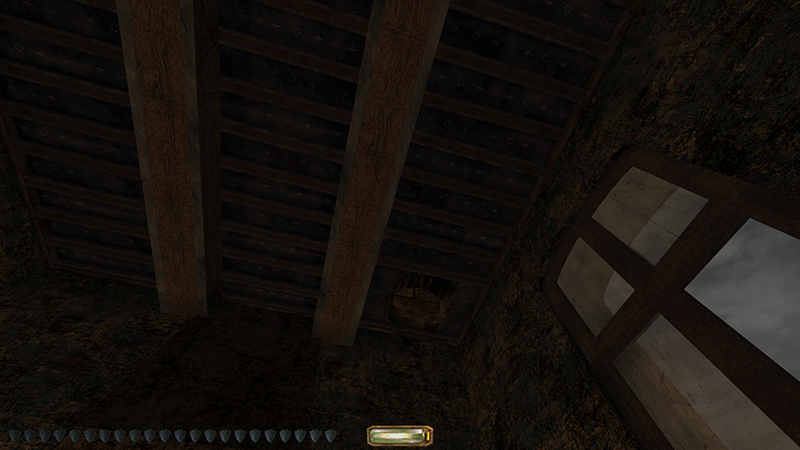 Just finished the second floor ceiling of the front tower. It was a lesson in texture alignment, and maybe took a little too long when I realized the way I started was illogical. It is part brush, part object, and pretty efficient. The hole in the ceiling is going to be populated with non physical decorative boards to help it look more real and not so round. I'm laying off of it for now until I know more about what the floor above is to be like. I've been playing around with a ivy generator plugin for sketchup as well. I'm still trying to work out how to get it to look okay enough, but not cost so many polys. What you saw there was still nearly 2000 sadly, and, I'm having issues with the inside vines are rendering in front of the leaves. But the plugin that does this makes a lot of component models so I think this is the reason. I will try "normalizing" them all to one model to see if that helps. When all said and done the main vines outside won't have many leaves, and will be thicker, so that will save some polys. 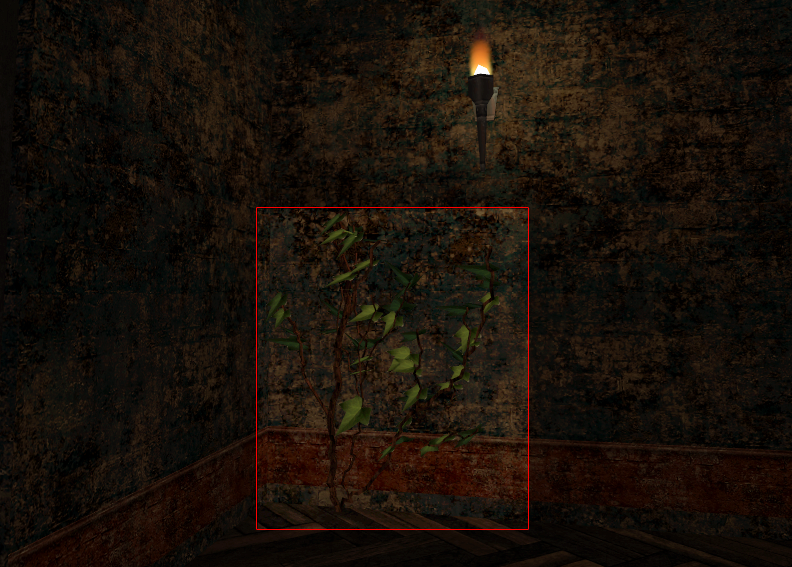 If I can find a poly cheap method I plan to use these vines and ivy as a way to have some lighting in places that aren't lit otherwise, by adding vhots where I will attach glowing flower bulbs. What color should I go with? Was thinking something that added contrast the blues of the sky and the browns of my crungy area. 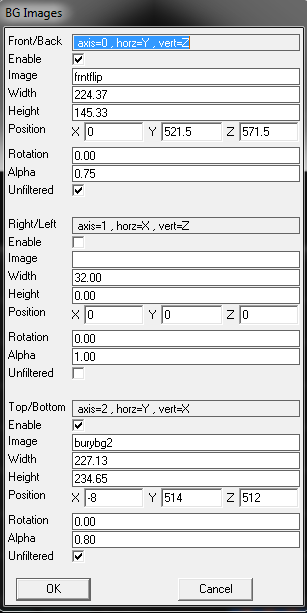 The generator is finicky and uses sliders for most of its attributes. For all the trouble it's very cool that I can export the world-rep from Dromed, import it into sketchup, then have this ivy crawl over it, so that object will custom fit the nooks and crannies of my brush work.